Pregnancy diets rich in a substance known as gluten might be linked to an increased risk of babies and children developing diabetes. This will discuss topics such as what the substance is, the dangers of diabetes in young people, why pregnant women might eat more products containing the chemical, the findings of a study linking gluten diets in pregnant women to diabetes in their children and the dietary changes pregnant women can consider as a potential safeguard. This substance is a type of protein found in many grain products people commonly consume. Foods that contain significant quantities of the product include pasta, bread, cereals and crackers. In addition, the substance might also be a component of foods possessing grains like rye, wheat, barley and oats. Diabetes occurs when the body either does not produce insulin or experiences difficulties producing it. The illness also interferes with how the body metabolizes sugar. Therefore, a stricken individual must carefully monitor their sugar intake. In infants and children born with this condition, extra care and monitoring of their diets must be overseen by their parents and doctors to avoid illness and potentially serious health complications. Pregnant women might consume diets that contain more proteins to maintain energy. These foods containing grain products are often healthy for mother and baby. Researchers representing the Bartholin Institute in Copenhagen, Denmark found that women who consume gluten-rich diets while pregnant have an increased risk of her unborn child developing type 1 diabetes. Type 1 diabetes is an autoimmune disorder where the immune system attacks insulin-producing cells in the pancreas. Type 1 diabetes differs from the type 2 variety, which develops as a result of environmental factors like diet and a sedentary lifestyle. Researchers studied more than 64,000 expecting women from 1996 to 2002. Scientists gauged the subjects’ dietary habits by asking them questions about the types of foods they regularly consumed. On average, the examinees ingested 13 grams of gluten-based products per day. Some of the study participants consumed as many as 20 grams per day. Researchers further concluded that roughly 250 subjects gave birth to children who developed diabetes. Moreover, the examiners discovered the risk increased significantly with every additional 10 grams consumed on a daily basis. Study organizers are not positive why the substance and diabetes share such a significant correlation. That said, some declare that gluten-based edibles might contribute to cellular inflammation. The chemical is known to precipitate an autoimmune disorder, known as celiac disease, which attacks the small intestine and causes a number of bothersome digestive manifestations. Researchers affirmed that, while these findings are interesting and should serve as a motivation for further research, such data does not guarantee that expecting women who eat a certain number of gluten-rich foods will definitely give birth to children who will be afflicted with diabetes. 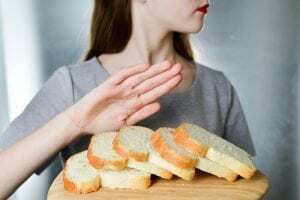 Women who are concerned with such findings might take added precaution by adhering to either a gluten-free or gluten-restricted diet. These women can still receive an adequate amount of vitamins and other nutrients through the intake of foods like fruits and vegetables, eggs, meat, fish, poultry and most dairy products.